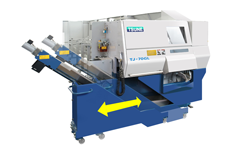 High speed circular sawing machine. 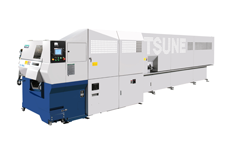 TJ series can cut off faster than TK5C series circular sawing machine. Modular chip conveyor, shutter can provide easy maintenance and clean work environment. Simple HMI can support easy operation. 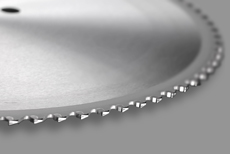 Excusive Tipped Saw blade can provide up to 40% higher productivity. Modular chip conveyor system for easy maintenance and various chip styles. 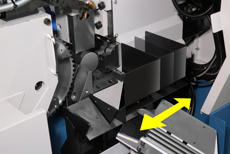 Chip Shutter system reduces chip scattering by up to 95%. Wider bar loading zone up to a max. of 250mm from reference stop. 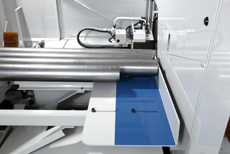 Safety covers for base machine and auto loader can provide safer work environment. 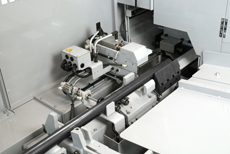 Faster GFC motion reduces cycle time, and increases productivity. Menu driven interface for simple programming. 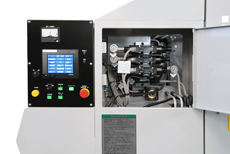 Hydraulic valves next to the interface provides easy access for quick adjustment.